Bijeljina is a city in Bosnia and Herzegovina. It is located in the Republika Srpska entity and is the provincial center of Semberija, a geographic region in the country's northeast. As of 2013, it has a population of 107,715 inhabitants. Petar Karađorđević I monument. He was the King of Serbia from 1903–18. In 1838, the first confessional elementary school was opened. A modern school building was built in 1902. In this school Jovan Dučić, famous Herzegovinian Serb poet, writer and diplomat, worked between 1893–95. 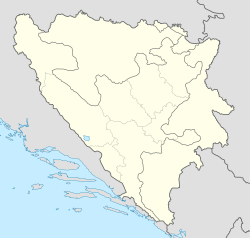 In September 1991, Bosnian Serbs proclaimed a Serbian Autonomous Oblast with Bijeljina as its capital. In March 1992, the Bosnian referendum on independence was passed with overwhelming support from Bosniaks and Bosnian Croats. Local Bosniak Patriotic League had been established in response to the Bosnian Serb proclamation and started the clashes. On 1–2 April, the SDG and the JNA overtook Bijeljina with little resistance; A massacre was carried out and involved the killing of between 48 and 78 civilians by Serb paramilitary groups. The majority of those killed were Bosniaks (or Bosnian Muslims). The dead included members of other ethnicities, such as Serbs deemed unloyal by the local authorities. The killing was committed by a local paramilitary group known as Mirko's Chetniks and by the Serb Volunteer Guard (SDG, also known as Arkan's Tigers), a Serbia-based paramilitary group under the command of the Yugoslav People's Army (JNA) that was controlled by Serbian President Slobodan Milošević. According to the 2013 census results, the city has 107,715 inhabitants. Also, there is OFK Zenit Bijeljina, young club from Bijeljina but their youth teams had earned a lot of medals in BiH, Serbia, Slovenia, Romania, Austria, Germany. Their stadium is ‘Zenit Arena’ in Novo Selo, 5 min from the city center. OFK Zenit competes in the leagues of Football Association of Republika Srpska (FSRS). They have the contract with Zvijezda 09 (team in Premier League BiH) to Zenit’s youth teams play like Zvijezda 09’s players. ^ "PRELIMINARY RESULTS of the 2013 Census of Population, Households and Dwellings in Bosnia and Herzegovina" (PDF). Bhas.ba. Retrieved 3 January 2018. ^ "Preživjeli logoraš iz Batkovića: I danas sanjam da mi neko ulazi u kuću i stavlja pušku na čelo". Oslobođenje. 1 April 2015. Retrieved 18 April 2015. ^ "FRIENDSHIPS FLOURISHED IN BATKOVIC PRISON CAMP". Sense Agency. 3 April 2013. Retrieved 18 April 2015. ^ "The Serbian Project and Its Adversaries: A Strategy of War Crimes". Google Books. 2003. Retrieved 18 April 2015. ^ a b "Popis 2013 u BiH – Bijeljina". statistika.ba (in Bosnian). Retrieved 29 December 2018. ^ Tavna monastery infosite, Bijeljina.net; accessed 9 July 2015. ^ "МЕЖДУНАРОДНО СЪТРУДНИЧЕСТВО НА ОБЩИНА РУСЕ - Побратимени градове". Община Русе [Municipality Ruse] (in Bulgarian). Archived from the original on 5 August 2013. Retrieved 12 August 2013. Wikimedia Commons has media related to Bijeljina. This page was last edited on 17 February 2019, at 00:42 (UTC).